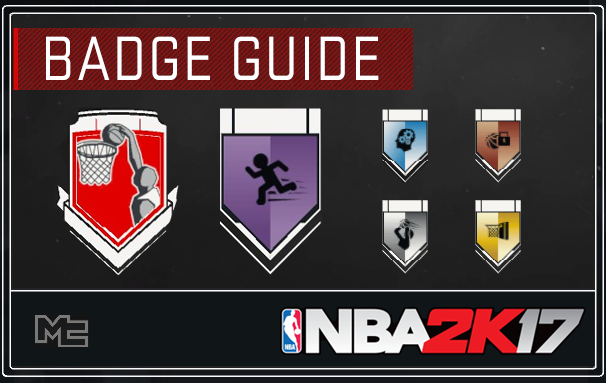 This NBA 2K17 guide was written to provide you details on how to unlock every badge for your MyPlayer in MyCareer mode. This is a work in constant progress so please feel free to post comments and corrections as you find them. This year skill badges are divided into 5 tiers: Bronze, Silver, Gold, Hall of Fame and Grand Badges. You'll earn the bronze tier after you unlock the badge, which then can be upgraded to silver and gold using VC. Personality badges only have 1 tier and cannot be upgraded. Grand Badges are an upgrade to the Hall of Fame versions. It's a badge you unlock once you master your specific Archetype skill sets. This is a temporary badge that activates if you do a specific action in a game. You fill up your meter by getting assists if you're a Playmaker or by making shots if you're a Sharpshooter etc. Once you fully fill the meter, you will get a temporary attribute boost. Tireless Scorer A player who can spend good deal of the energy without losing any effectiveness while attempting to score Attempt 400 shots while moving. Watch the difficult shots video. Friendly A typically well-liked and outgoing player These are earned through your responses in scenes. The more positive/excited answers will lead to the Friendly badge. Unpredictable Can be erratic in behavior This is earned if you get either the Laid Back or Expressive badge first, and then you start shifting your answers in scenes enough towards the other end of the spectrum.